Art week continues...and what art week would be complete without the iconic Jackson Pollock inspired splatter mani? I didn't base mine off an individual painting of his, just the concept. And I knew I wanted to showcase polishes from OPI Skyfall Collection. 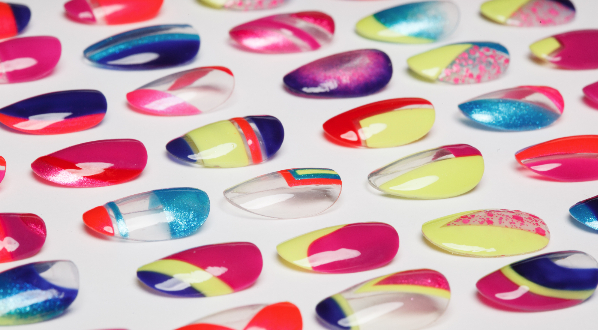 For more information and to shop: visit www.opi.com, follow OPI on Twitter @OPI_PRODUCTS and become a Facebook fan! I used OPI Moonraker for my "canvas" base. It's the only one of the bunch in this collection with a slightly problematic application. I initially used OPI Nail Envy as my base coat, but when I went to apply Moonraker..it literally slipped around on the nail like an oil patch!! I tried a bit more then decided to go another route. NO BASECOAT. This polish applied much better that way. I have on 2 coats. It needs a gentle steady application as it shows brush strokes. I do really like the color, it's an interesting blueish silver. I splattered with: Skyfall, Casino Royale, The World is not Enough, You Only Live Twice, The Spy Who Loved Me, On Her Majestys Secret Service using a small drink box straw, I find that easier than the large straw. What do you think?? Stay tuned for tomorrow's Art Installment and see what the other ladies have created for today! I love the colors! The red sort of looks pooled up and bunched together - which gives it an awesome textured look! Pure awesome! I love this so so much! 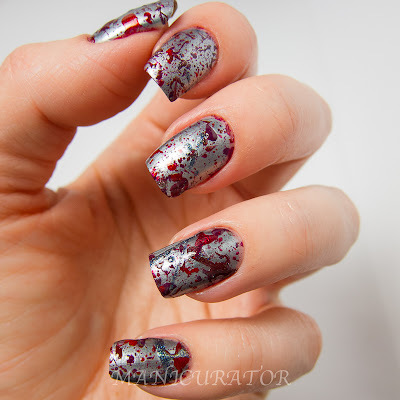 Perfect for Halloween, these look like blood splattered nails. I guess I am not much into the whole spattered look. But this was like ewww, sort of gruesome. Hi Kellie, I named 6 colors, and I promise you they are all on there. I enlarged the close-up pic, so maybe it will help them be more visible. wow this looks different but cool. I absolutely love the color combo. 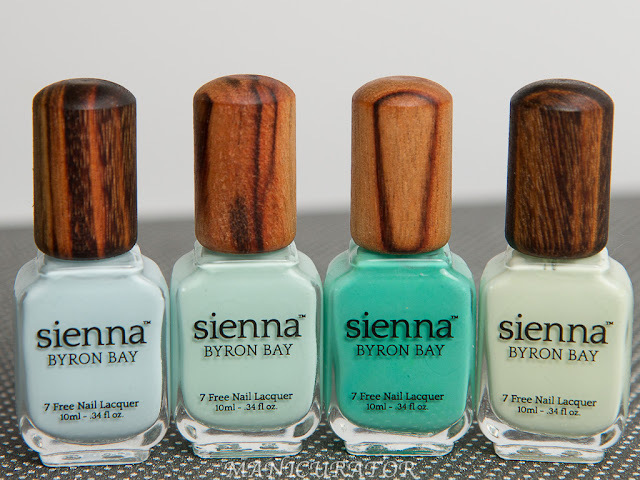 I'm gonna have to incorporate those two colors in a mani. 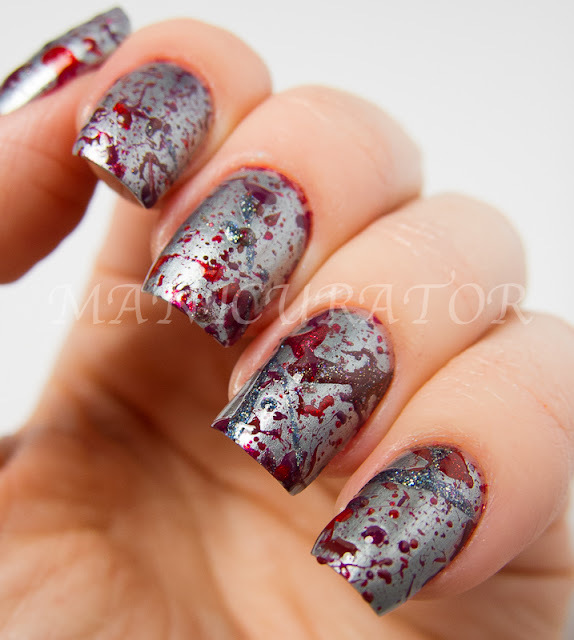 They look great, and reminds my of bloodsplatters, It might be a good one for Halloween. 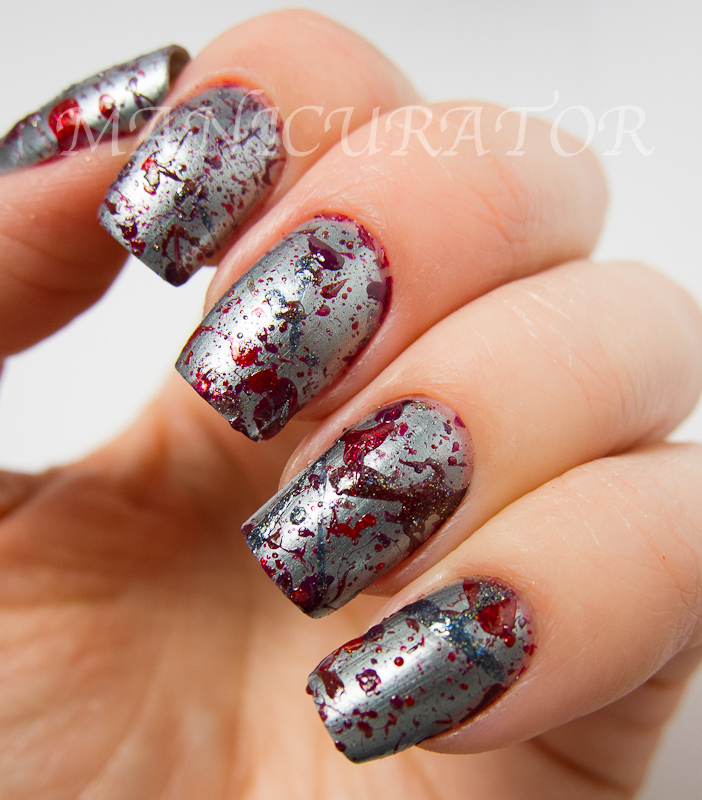 Nice and bloody :) Love those splatters....they take a long time to dry don't they? Wow, that was just amazing! I just found your blog today and I will be back! Very nice pictures. Greetings from av very cold Stockholm. Somehow I must've missed this one but I really LOVE it.